24 packs of 14 cards. 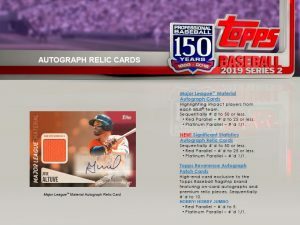 2019 Topps Series 2 Baseball Cards Hobby delivers (1) Autograph or Relic Card in Every Box! 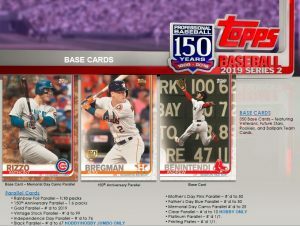 The excitement of the 2019 MLB season continues in Topps Baseball Series 2! Look for ALL-NEW inserts, autographs and relics with additional parallels throughout this iconic release. 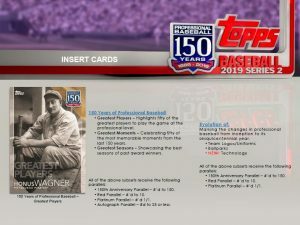 Parallels – 150th Anniversary #’d to 150, Gold #’s to 50 or less, Red #’d to 25 or less HOBBY ONLY!, Platinum #’d 1/1 HOBBY & JUMBO ONLY! Parallels: Red #’d to 5 Platinum #’d 1/1 BOTH HOBBY & JUMBO ONLY! 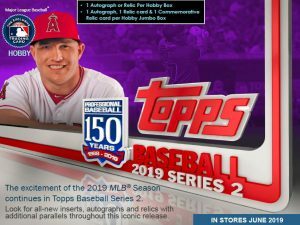 Commemorative Relic Cards – HOBBY & JUMBO ONLY! 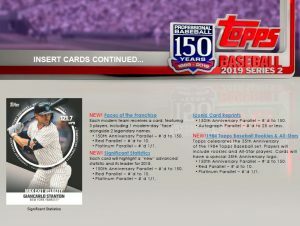 Parallels – 150th Anniversary #’d to 150, Gold #’d to 50, Red #’d to 25, Platinum #’d 1/1 HOBBY & JUMBO ONLY! 1984 Topps Baseball Relics – HOBBY & JUMBO ONLY!